Metal Detector Training - Seminars Booked Out - When Do You Want More? Which Dates are You Interested In for Training Second half of 2012? We were completely overwhelmed with the interest in the Gold Prospecting and Metal Detecting Seminars we will be holding in Cue starting from March 24/25 weekend. The courses we set for the first half of 2012 are booked out. The reason is probably because we only cater to a small group each time to ensure we can give personalised attention to each person. Sorry if you missed out but later in the newsletter we will show you how to tell us when YOU would like future seminars to be held later in 2012. ? For those that have had their attendance confirmed, we will be sending out invoices around a month before the course with more information about it and metal detecting localities you can use after the seminar. The Cue Accommodation page is updated regularly so make sure you continue to look at the options available. Accommodation in Cue Page. A reader of the website from Germany (Jens Klinner) came over to WA to do a bit of metal detecting just recently. Imagine going from the cold of Europe (Jens has also metal detected in Finland!) to the Summer Heat of Cue and then gold prospecting in February. You have to be keen! Udo put him on to some good available ground and he had a ball finding some nice gold over a 2 week period in total he found 64 grams of gold with a beautiful 48 grammer nugget - its on the Brag Page here Jens 64 grams of gold. Just scroll down to the last picture to see the details of the gold. Two important Things About Jen's Find! This area will be part of the places we suggest you go detecting when you do the Metal Detecting Seminars - it is a large area of pending Exploration Lease. Who Says there is no gold left? With the gold season coming up many people will be tempted to buy a new or second hand Minelab metal Detector. In case you are not aware of it there are many counterfeit Minelab metal detectors being produced by shonky operators around the world. so please - BEWARE! Unfortunately there is really no way of us knowing exactly if a detector being sold online is genuine or a fake, just by looking up a serial number. The copiers have done a really good job of cosmetically copying the detector which includes the serial number sticker, all the decals, and even the security sticker that we introduced to try to combat them. The only real way of assuring yourself of an authentic detector is to trace it’s pedigree – where was it purchased, was that a legitimate Authorised dealer, etc. There is a real flood of dodgy 4500’s out there and buying off eBay or through non-authorised sellers is a huge risk at present. For those who want to buy a second hand unit, obviously the safest way is to purchase from a Minelab dealer. These have been checked, and the dealer usually offers some form of warranty. The next safest is for people to purchase in person, where they can visually inspect the unit, turn it on, test it, before any cash is handed over. Alibaba is notorious for fraudulent sellers, from companies who literally don’t exist, and have no product to sell. Type “alibaba scam” into a google search, and you will see many horror stories of people losing their hard earned dollars. Regarding warranty on new detectors, the Minelab warranty is valid worldwide, provided the detector was purchased from an Authorised Minelab dealer, so if any faults were to occur, you can send it to your nearest service centre. We are great believers in buying from your Authorised Minelab dealers in WA whether it is a new Machine or Second Hand machine. We prefer to buy locally with a reputable authorised Minelab dealer that we trust and if anything goes wrong they will support the machine. You can also get a new 5000 for a shade over $6200 now so it's come down a bit in price locally. BUT most importantly the local dealers will support and help you. They also help with training and advice on the things you need to go prospecting. DISCLAIMER - we have no links with local WA Minelab dealers or Minelab either financially or in any other way except with our day to day, arms length, commercial dealings with them. This article is not promoting a specific dealer just the common sense of protecting yourself by dealing with local Minelab or other Metal Detector providers! Trevor Powell of Advantech the people who provide Trackranger GPS software contacted me recently about their customers who would like to use Goldmine Finder Information and GPS Points in the Trackranger software. Advantech seem to be a very customer focussed company and they soon had a solution to the issue. If you are a Trackranger GPS software user then the data from the Goldmine Finder software can be easily imported to Trackranger. Udo and I apologise if you missed out on our first half of 2012 Gold Prospecting and Metal Detecting Seminars. We were honestly overwhelmed by your support and embarrassed that we could not accommodate everyone. The reason why the seminars are limited in numbers is so we can focus individually on each person's needs. Our Vision is to give you the right information, knowledge and tools so you can confidently go away from the course and put those things into practise to find your own gold nuggets, legally and without spending years on the necessary learning curve. ...OR, decide the investment in time and money was not what you want so you dont spend a lot of money on a metal detector that gathers dust in the cupboard. Do YOU Want More Training in the Second half of 2012? If you do please tell us when and we will arrange some courses, here is the page that you can tell us when you would like training after July. We will try to fit in with your needs! 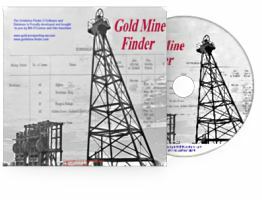 Goldmine Finder Software and Data CD. Nobody gets ALL the gold. Theres still plenty left for you. Oh Yeah, Just ask Jen! p.s. Its time to start thinking about Gold Prospecting and metal detecting in 2012 - Things are starting to cool down so start your preparations! !